Most public and media attention to the questions that will appear on our ballots next Tuesday has focused on questions 1 through 4. But for WalkUP Rozzie and many allied organizations, Question 5 has the greatest impact potential. We need your help in spreading the word (both via social media and in the real world)! Currently, too many people in Boston lack adequate access to parklands and open space. WalkUP Roslindale strongly believes that safe, enjoyable streets, parks, and neighborhoods should not be a privilege afforded to some, but a right guaranteed to all. It’s time to invest in a better, more equitable Boston. Through CPA, the City of Boston has an opportunity to generate over $20 million every year in dedicated funding to create and improve parks, restore historic sites, and build new affordable homes throughout Boston’s neighborhoods. Thanks to our friends at Livable Streets Alliance for help with this copy. See also the Yes on 5 website and this well-written column from Adrian Walker at the Boston Globe in support of the measure. 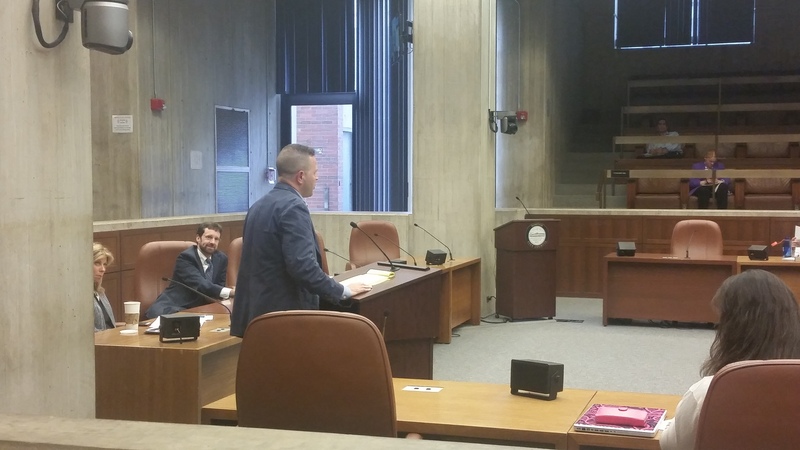 Earlier this week, we offered testimony at a Boston City Council hearing on parking issues. Although the connection between walkability and parking policy may not be immediately obvious, because parking uses up billions of dollars of some of our most valuable urban real estate and has a substantial cascading effect on all forms of transportation, it stands at the core of any effort to move our neighborhood and our city toward walkability and sustainability. Our comments were also sent by letter; the text is reproduced below, full version available as a PDF. …over the years some residents have persuaded the city to tighten zoning rules to the point that their own neighborhoods could never be rebuilt the same way. The Riverside area had previously been downzoned to the point that 59 percent of existing buildings break the rules, according to the city’s Community Development Department; under the new restrictions, a full 80 percent of existing buildings would be nonconforming. The most specious of the petitioners’ arguments, however, is the idea of preserving “character”. They have happily actually defined what they mean: single family homes. But the slightest examination of the neighborhood dashes that idea to pieces. The area of the proposed change is a pleasing mix of styles, heights, types, ages and uses. Yes, there are a few single family homes, but there are also triple-deckers, brick apartment buildings, row houses, a complex belonging to the Cambridge Housing Authority, mixed-use buildings, schools, churches and parks. Hardly any two buildings are alike. Making Riverside into an exclusive country club will only line the pockets of homeowners and prevent people from moving in and improving the neighborhood with their individual touches and styles. With its transit accessibility, walkability and a population already going car-free, Riverside is the perfect neighborhood for new, parking-free apartments and homes. An additional concern raised in opposition to the project was that the LC zoning from which so many variances would be required is part of a neighborhood-wide Roslindale strategic planning/rezoning effort that was completed in 2007. Accordingly, to paraphrase how the argument went, there should be no deviating from that zoning because it reflects the neighborhood’s established preference, which was, it is said, to (1) preserve the existing density and character of this LC subdistrict and, more importantly, the surrounding 2F-5000 (“Two Family-5000 Square Feet”) residential subdistrict, and (2) channel development like this project to the commercial district in Roslindale Square. Focusing first on the 2F-5000 residential subdistrict in which all of the Longfellow Area except the LC subdistrict has been zoned, it is critical to realize that “2F-5000” is itself a misnomer. When you look at the dimensional table for this subdistrict under Article 67 (the Roslindale Neighborhood Article), it’s actually a minimum of 5000 square feet (SF) in lot size for the first dwelling unit, and then a further 3000 SF for the second unit. So, it’s really a “1F-5000/2F-8000” zone. Now, consider for a moment that the most common lot size in the neighborhood is actually closer to 4500-4800 SF in area. For example, the lot for my single-family house is 4600 SF in area, and the lot sizes for the existing 2 families on my street are 4900 SF, 4340 SF, 5150 SF, and 4600 SF. In other words, the zoning that was adopted in 2007 means the majority of us are non-conforming at the most basic level. This is not insignificant since any infill development (think of the scattered “double-lots,” many of which don’t meet the 5000 SF threshold) would have to meet this ill-fitting standard, and non-conformity applies also to additional dimensional aspects of the typical developed lot in the neighborhood, such as side yard widths (required to be 10 feet on both sides for detached structures – my house and every house on my block has at least one side yard that is narrower than 10 feet – most houses in the subdistrict do), rear yard setbacks, FAR, you pretty much name it. In addition, the parking requirement is 2 off-street spaces per unit throughout the entire Roslindale district (not just the 2F-5000 zone), with only limited exceptions right in Roslindale Square and for affordable units. I have a single space on my lot. Several of my neighbors have 1 space or no spaces at all. Overall, then, the zoning for our neighborhood, ostensibly meant to “preserve” us, actually treats us, with few exceptions, as legally not within the vision of what the neighborhood “should” be. In practice, this means that the existing zoning requires almost any change in the neighborhood’s built environment to go through the zoning relief process. An object lesson in exactly this issue was in fact given at Monday night’s meeting. The first item on the agenda was a single-family home owner on Walter Street who was before LANA to seek support (or at least non-opposition) for his proposal to add a dormer to the upper story of his house to allow for a second full bathroom. He needed relief because the existing house, which appeared to be similar to almost every other house in the Longfellow Area, is non-conforming and the dormer would exacerbate that non-conformity. Thankfully for him, he appears to get along well enough with his immediate neighbors that this small change is not an issue. But the question has to be asked as to what kind of land use regulatory system would routinely require this level of process for such a small change? The same mismatch of the current zoning with existing use and development, let alone what we might want, occurs in the LC subdistrict in which the South Street project is proposed to be located. The most obvious mismatch is the 0.5 FAR, with which I suspect none of the properties currently comply and which, if it were really to be complied with, represents a fundamentally dispersed, low-density suburban vision for this area. Furthermore, if the saving proposition of the rezoning was supposed to be that Roslindale Square was rezoned to accept more development, that didn’t actually happen. The two projects that have been done – the 3-story commercial building that replaced the old abandoned gas station, and the substation/funeral home redevelopment – both required zoning relief in the form of variances. In other words, the zoning for the square was so good that it had to be varied from to do two projects that the community wanted. Should they also have been told that the zoning was relatively new and they would have to live with it? To summarize, we have what amounts to “zoning by variance” and it has been quite effective at slowing the pace of change. That may have worked in a period when Boston’s population was declining or remaining flat. It does not and cannot work when population is increasing, as it is today and appears poised to do for the foreseeable future. This is why the Mayor’s housing plan is so important to support and why Imagine Boston 2030, the citywide planning process that is just now getting going, is to important. We can no longer afford to treat any part of Roslindale as totally off limits to change, as if there were a growth boundary around the square and that is it. The square is great, but it can be better for everyone, and it won’t be better unless we welcome new neighbors within walking distance of its amenities. Join your Roslindale neighbors and City Council President Michelle Wu for a screening of “This Changes Everything” — a documentary film about the effects that climate change is having on real people, in real places, today. Following the film will be a brief conversation about how to get take action for climate resiliency and adaptation in Boston, including efforts to stop the high pressure natural gas pipeline being constructed in neighboring West Roxbury. The screening will be on Saturday, October 15, 2016, starting at 6:30pm at the Roslindale Congregational Church at 25 Cummins Highway. Please RSVP at the Eventbrite page for this free screening.